This entry was posted in Weapons by Chuck Hill. Bookmark the permalink. 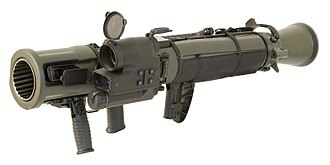 I would never be one to discount what a valuable asset a recoilless rifle can be. But, I think the USCG might be better served with something like the Javelin missile. 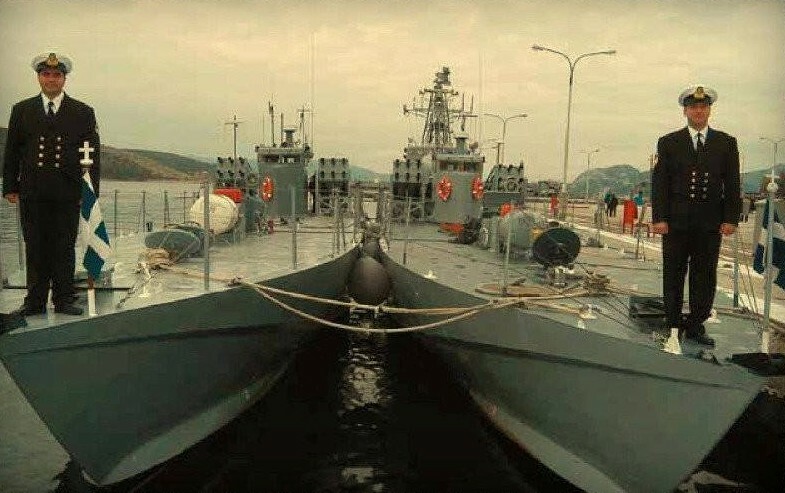 With cutters and patrol boats equipped with RWS that can mount & fire the missile, while also having handheld Command Launch units onboard able to utilize the same missiles. The missiles have more than double the future long range recoilless rounds. Plus, along with their direct-attack mode, they also feature a top-attack mode. Not to mention the Javelin’s warhead weighs in at more than twice as much as a complete 84 mm round, so it likely has 4-to-5 times as much explosives. Now, Gustav might be a better system for the small boat harbor protection fielding. Especially cost wise. Point the boat, shoot and hope for the best. I still don’t know how they thought they would hit anything afloat! With the all the islands you are bound to be pointing at some land….. They were conceived as anti-ship weapons. The idea was to get in very close against larger vessels and let loose a barrage. I suppose if you could surprise a larger foe in constricted waters it might work. Surprise and very close range being the keys. Don’t the North Koreans like to fit recoilless rifles to their small craft? Seems suicidal unless you can hide and then get the drop on your adversary. I would not want have wanted to crew those boats durring a conflict. The Javelin idea would be a much better choice for the CG. More more likely to hit the target obviously. It could also be stored unobtrusively. 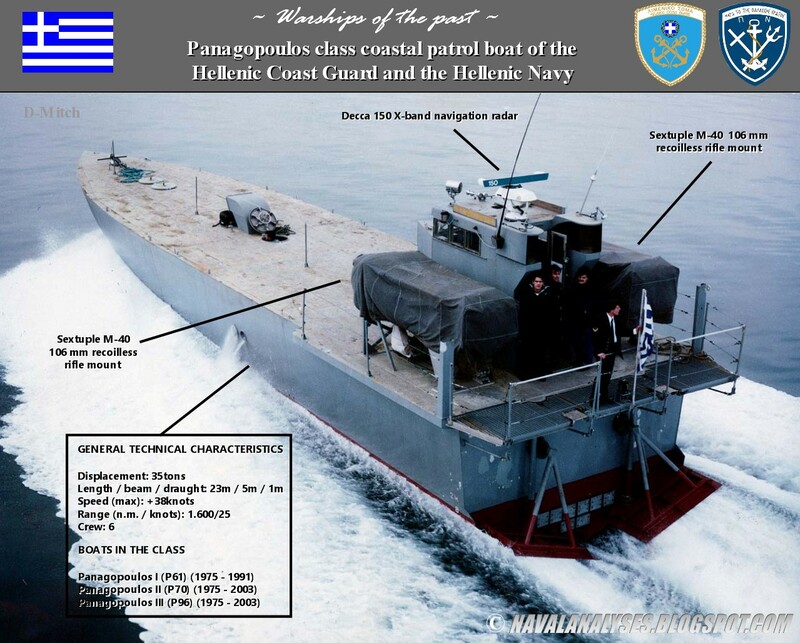 The story is they were actually donated to the Hellenic Navy. I think the gentleman was a senior rating in the reverse and ran a boat building business or something. The only way a small craft can stop a big one as Chucky often says is torpedoes. Missiles, especially small ones, won’t do much. (I always remember the incident in the Falklands War where a Lynx ‘offloaded’ several Sea Skua into a trawler and the latter survived.) And aimed at shots at the bridge doesn’t seem like a good idea, hough to be honest nor does blowing the rudder off a large vessel, as it would create a hazard to navigation. The vessel that took three Sea Skua hits, ARA Alférez Sobral (A-9), was a 143 foot former USN tug. The Coast Guard also had some of this class (USCGC Modoc WMEC-194 and Commanche WMEC-202). They were a bit over 800 tons full load and good for 13 knots. For those not familiar with the Sea Skua, it is a 145 kg missile with a 30 kg (66 pound) warhead. https://en.wikipedia.org/wiki/Sea_Skua#Falklands_War. It is about three time the size of Hellfire. @x, I got the impression that you may have thought that the Sea Skuas may have been aimed at the bridge of ARA Alférez Sobral (A-9), (it was hit twice in the bridge) rather I think it was a result of the way the missile is guided. Sea Skua is semi-active radar homing missile. The Helicopter illuminates the target and the missile homes on the reflection. If you look at a photo of the ARA Alférez Sobral (A-9) you will see that the bridge area probably provides the strongest reflection. Second, all sea skimmer missiles seem to strike well above the waterline. On approach they fly at a preprogrammed height above sea level, and while I have often thought they should be programmed to make terminal dive for the waterline, for what ever reason, I have never seen one programmed this way. Plus the target has relatively little freeboard. You might remember that when the Israeli vessel Hanit, a Sa’ar 5-class corvette, was hit, it was also well above the hull. A clever counter to radar homing might be to put strong reflectors over a part of the hull that does not critical and that has no superstructure. This the reason I want to be able to target specific parts of a vessel, specifically so that we can prevent a terrorist ships from reaching its target, even if we can’t sink it. If we can stop it, it will give us time to muster the strength to ultimately deal with it. Instead of a shoulder launched missiles with an untested guided version, why not a proven guided one already combat proven and in service; the tow missile? There tens of thousands in service with the army & marines. It can be fired from a mount as simple as a tripod or a modified.50 mount. As they have been being replaced by the javelin by infantry and hellfire for mounted use, the CG could get some from storage relatively cheap. It can be used on any cutter from a 85 footer on up due to simple mounting needs. For the FRC on up you could actually have both a mount on the cutter AND the boats. You simply put the sighting module and a round on whichever you are using, or on both depending on how many sighting units the CG is willing to buy. Range is around 2 miles. The newer Tow-2 has a top- attack feature where it is flown over the target. Against a big merchant ship this could be good for taking out terrorists on a ships bridge or the cockpit of a hard to hit swarm boat in the gulf. Small warhead. You have to manually guide it to target. Keeping a laser designator on “target” is easier than keeping it in the crosshairs, especially against swarm boats. For bigger stuff, the lwt torpedo is probably best. TOW missiles are not fired from a moving platform. The semi-automatic command to line of sight (SACLOS) wire guidance (and now RF becoming available slowly) requires a constant view of the IR beacon on the rear of the missile. And, as the wire spools from the missile, movement of the launch platform could sever the wire link. Wire guided weapons (which make up the preponderance of the TOW war stocks) can not be fired over bodies of water. TOW missiles are not being replaced by the Javelin in the US Army. This is a gross misunderstanding of the Army’s intent to mount Javelins externally on vehicles remote weapon stations. No. My assertion was that even against small ships small missiles aren’t much use. I spoke about the bridge purely speculative, a head shot one stop kill as it were. I know the Lynx didn’t aim specifically at the bridge and I appreciate what you say about the technology used in Sea Skua. @x, yes, ships are actually pretty difficult to stop, and they have gotten bigger and tougher. Missiles may get a mission kill on a warship by wrecking their sensors, but it takes a lot more to physically stop a ship with a determined crew. The best option as always is boarding. I wonder if drones will facilitate that in the future? Either getting humans aboard, or as human analogues? Throwing HE around is a dead end. I would anticipate that we will learn that a terrorist attack I underway as a result of an attempted boarding. I don’t really have a lot of optimism about attempting to board a terrorist controlled ship if everyone aboard is a terrorist and they are armed. First we have only two teams, trained to do opposed boardings, one on each coast. Meanwhile we have at least thirty ports or port complexes so the likelihood of being in the right place at the right time is slim to none. Second, if we do attempt an opposed boarding against a well armed crew, there is a high probability of failure. Our helicopters are not armored and barely armed if at all. The terrorists have better knowledge of the layout of the ship and have had the opportunity plan traps and fields of fire. A regular boarding party is either going to be refused permission to board or be allowed to come aboard and then the terrorist may attempt to take them hostage or kill them. Actually if I thought there was any chance of getting a heavy weight torpedo on cutters I would have recommended that, but probably no chance. Don’t know until you try.